Way too many accidents happen at night on FL roads. There are a lot of factors, but a big one is simply visibility: if you can't see something, it's hard to avoid hitting it. There are some things Crystal Springs drivers can do to make sure they can see as much as possible when they're driving in the dark. First of all, keep your windshield clean. Glare from oncoming headlights can obscure obstacles in the road. Clean off that film that builds up on the inside of your windshield. And make sure you have good wiper blades and plenty of washer fluid. Now it could be that your headlights aren't as bright as they used to be. It happens – the bulbs just dim over time. If it's been a couple of years since you replaced your headlamps and they aren't lighting up the road like they used to, get some new ones. They make upgraded headlamps too that give you a brighter light and a larger field of vision so you can see better and further down the road. Check with your friendly and knowledgeable Bob's Auto Repair Inc if you want to up your headlamp performance. 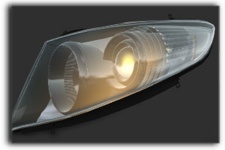 Another very common headlamp problem in the Crystal Springs area is cloudy or yellowed lenses. These days lenses are plastic and they oxidize and discolor over time. Just look at the cars in the parking lot at your Crystal Springs office building – chances are you'll see several with cloudy lenses. This is a huge problem because some of the light coming from your headlamps gets trapped before it can even get out and shine down the road. Replacing a set of headlight assemblies can run hundreds or even thousands of dollars in Zephyr Hills. There's an alternative that can save Zephyr Hills big bucks: headlight restoration. Your Bob's Auto Repair Inc technician can remove the oxidized layer from your lenses. He'll then polish the lenses until they're bright and smooth. When he's all finished, your lenses will be as good as new. Any accident on FL roads and streets is inconvenient and can be dangerous. And if someone gets hurt, well, that's something you want to avoid at all costs. If you're not confident driving at night in Crystal Springs, ask your friendly and knowledgeable Bob's Auto Repair Inc about headlamp replacement and headlight restoration Zephyr Hills.